For nearly nine decades, science’s favorite explanation for the origin of life has been the “primordial soup”. This is the idea that life began from a series of chemical reactions in a warm pond on Earth’s surface, triggered by an external energy source such as lightning strike or ultraviolet (UV) light. 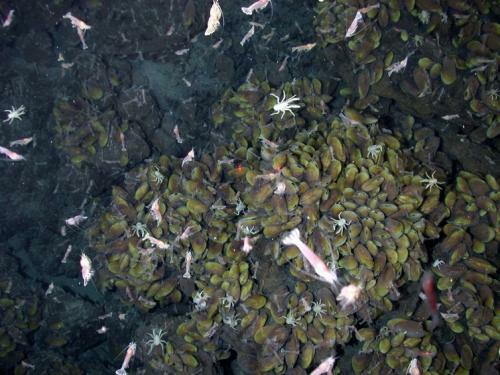 But recent research adds weight to an alternative idea, that life arose deep in the ocean within warm, rocky structures called hydrothermal vents. A study published last month in Nature Microbiology suggests the last common ancestor of all living cells fed on hydrogen gas in a hot iron-rich environment, much like that within the vents. Advocates of the conventional theory have been sceptical that these findings should change our view of the origins of life. But the hydrothermal vent hypothesis, which is often described as exotic and controversial, explains how living cells evolved the ability to obtain energy, in a way that just wouldn’t have been possible in a primordial soup. Where this energy comes from and how it gets there can tell us a whole lot about the universal principles governing life’s evolution and origin. Recent studies increasingly suggest that the primordial soup was not the right kind of environment to drive the energetics of the first living cells. It’s classic textbook knowledge that all life on Earth is powered by energy supplied by the sun and captured by plants, or extracted from simple compounds such as hydrogen or methane. Far less known is the fact that all life harnesses this energy in the same and quite peculiar way. This process works a bit like a hydroelectric dam. Instead of directly powering their core metabolic reactions, cells use energy from food to pump protons (positively charged hydrogen atoms) into a reservoir behind a biological membrane. This creates what is known as a “concentration gradient” with a higher concentration of protons on one side of the membrane than other. The protons then flow back through molecular turbines embedded within the membrane, like water flowing through a dam. This generates high-energy compounds that are then used to power the rest of cell’s activities. Life could have evolved to exploit any of the countless energy sources available on Earth, from heat or electrical discharges to naturally radioactive ores. Instead, all life forms are driven by proton concentration differences across cells' membranes. This suggests that the earliest living cells harvested energy in a similar way and that life itself arose in an environment in which proton gradients were the most accessible power source. Recent studies based on sets of genes that were likely to have been present within the first living cells trace the origin of life back to deep-sea hydrothermal vents. These are porous geological structures produced by chemical reactions between solid rock and water. Alkaline fluids from the Earth’s crust flow up the vent towards the more acidic ocean water, creating natural proton concentration differences remarkably similar to those powering all living cells. Deep-sea hydrothermal vents represent the only known environment that could have created complex organic molecules with the same kind of energy-harnessing machinery as modern cells. Seeking the origins of life in the primordial soup made sense when little was known about the universal principles of life’s energetics. But as our knowledge expands, it is time to embrace alternative hypotheses that recognise the importance of the energy flux driving the first biochemical reactions. These theories seamlessly bridge the gap between the energetics of living cells and non-living molecules.